You may have some experience rock climbing, and you probably have tried to climb a tree at some point in your life, but have you ever gone rock climbing on trees? Now you can! Do you think you have what it takes to ring the bell at the top of the climbing route, almost 40 feet high? 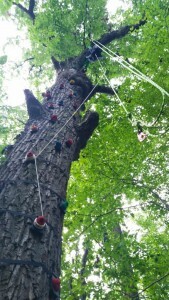 How about a tree climbing birthday party or a group outing at Treehouse World? This climbing route is 43' up a tree! 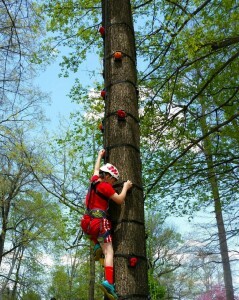 Tree climbing provides a sense of accomplishment because it involves overcoming physical and mental challenges. The first climb up the tree is usually about figuring out what it's like to use the climbing holds on the tree, and then discovering that it's safe to let go and descend when you get tired. But you can try again as many times as you want and people usually climb higher the second, third, and thirteenth time they climb. 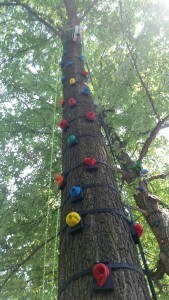 We Some of our climbing routes are higher than 40 feet in the trees, which is a perspective not many of us are used to! We all have a natural inclination to climb things, and this is better than having the kids (or the husband) climb on the roof of your ground house, isn't it? The best part? Being fearless. Making a move you couldn't make last time. Ringing the bell. Cheering your friends as they climb. Developing individual skills with group support make tree climbing an excellent group activity for team building or as an adventurous birthday party activity. Climbing a tree, one rock at a time! If you have rock climbing ropes, equipment, and experience, then here are some places for rock climbing in Pennsylvania (climbing on rocks, not trees). If you don't, then come climb our pre-established climbing routes on some big oak trees. Enjoy the fun of rock climbing in a totally unique way, since Treehouse World is the only place in Pennsylvania with approval to operate this activity. You can choose tree climbing as a birthday party activity or as an activity on your general admission pass. It looks like fun, doesn't it?